Voice of America (VOA) Polish Service director Ted Lipien and VOA English Service correspondent Wayne Corey interviewed the then Vice President George H.W. 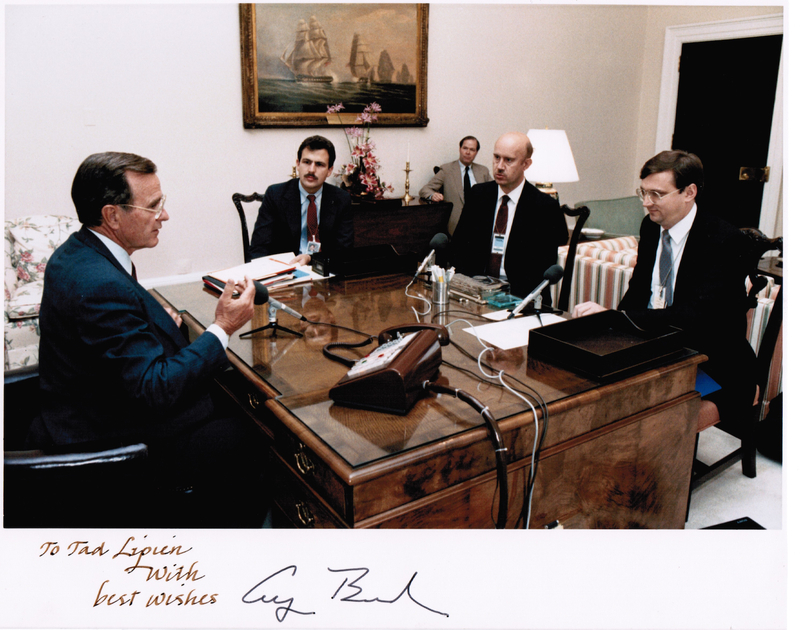 Bush on September 24, 1987 in his office in Washington shortly before his trip to Italy to see Pope John Paul II and to Poland to confer with government and opposition leaders. The faltering government of General Jaruzelski agreed to a visit by the U.S. Vice President, during which he urged Jaruzelski to come to terms with Solidarity leader Lech Wałęsa. Subsequent negotiations between the regime and the opposition resulted in a peaceful transition to democracy in Poland. Both the Voice of America and Radio Free Europe contributed to supporting democratic opposition in Poland with uncensored information and, primarily in the case of Radio Free Europe, commentary on human rights violations and other problems of communism. In later years, especially during the Reagan administration, the Voice of America also started to report extensively on domestic developments in Poland and regularly broadcast telephone interviews with Polish opposition leaders.